If not for the police barricades currently surrounding it, the J. Marion Sims statue on the East side of Central Park and 103rd street could serve as a portrait of urban serenity to unknowing passerby. Tucked away beside the sylvan walkway, the 18-foot statue of a middle-aged medical professional, gallantly posed, is likely to draw about as much attention as a hawthorn shrub in any other context. But as recent scholarship began to unearth evidence that Sims relied on racist and often sadistic-seeming practices to build his medical legacy, the statue drew the ire of protesters. Two years prior to when the events in Charlottesville thrust monuments into the national spotlight, two up-and-coming artists, Kenya (Robinson) and Doreen Garner, were fighting for a show at Pioneer Works. (Robinson) and Garner were looking to install sculptures more than eighteen feet tall, and Pioneer Works is one of the few art spaces in the city that both supports not-yet-art-world-stars and is able to house exhibitions of this magnitude. The artists’ pitch addressed notions of monumentality head-on — especially monuments that prop-up the achievements of White men. They labeled the exhibition White Man on A Pedestal. And Garner’s work — which frequently has an anatomical component steeped in the history of medicine — addresses the J. Marion Sims monument specifically. From early November until mid-December of 2017, Garner and (Robinson) transformed the main gallery at Pioneer Works into a sort-of ontological factory that renders the cruelty of a monument like the one to Sims, visible. Visitors move through the exhibition in a two-stage process: the first stage occurring around a series of Garner’s sculptures, which embed a history lesson in the neural pathways of the bodily unconscious, with harsh details from nightmares caused by studying the history of medicine in America. The second stage of the WMOAP ontological processing is undergone while experiencing (Robinson)’s sculptures, as she produces a portrait of Whiteness that forces participants to acknowledge the presence of hegemonic White masculinity in seemingly benign, everyday objects such as landscape design, architecture and statues. After the events in Charlottesville, Mayor Bill De Blasio initiated the Advisory Commission on City Art, Monuments, and Markers, and the Sims monument began to be singled out among the city’s controversial monuments. As the Advisory Commission’s public hearings concluded in late November, a letter signed by more than 120 prominent scholars was sent to the commission, citing three specific monuments for removal, the Sims monument was among them. Garner, a 32 year-old artist from Philadelphia, trained in glass blowing at RISD, has been studying Sims since 2015. “Most of the time I’m trying to sculpt a trauma,” Garner told me in an interview, “so that people aren’t people forgetting about the stories associated with the work…To burn the images and feelings into people. However, to someone who has yet to gain an understanding of Simss’ work and legacy, it would be difficult to understand what trauma Garner is referring to while standing beneath the honorific portrayal at 103rd St. Right hand clutching his double breasted coat, a gentle face gazes downward towards visitors. Accolades are carved in stone on either side of the bronze figure, referring to Sims as a surgeon, philanthropist and the founder of hospitals. The story that Garner has come to know, is much different. Some will point out that accounts of Sims’ cruelty vary; in general, however, the reputation of Sims has been steadily falling out of favor since scholarship about the doctor in the post-civil rights era began. Sims is best regarded for developing a surgical procedure to repair vesicovaginal fistula — a severe complication related to child birth that causes organ tissue to rot between the urethra, vaginal wall and bowels — a surgery that is used to this day. The “father of modern gynecology,” was at one point the president of the American Medical Association. In a detailed analysis of his entire life’s work, however, we find a young doctor from a lower middle-class background, desperate to make a name for himself in the pre-Civil War American South. A renegade often skirting around regulations, Sims began practicing in a wooden shack behind his Alabama home. It was in this shack where he began to see ways of creating a legacy for himself, when he received a number of patients who were suffering from vaginal fistula. As a child in North Carolina, Sims was indoctrinated with racist beliefs, including one that Black people do not experience pain as severely as others — a belief that still lingers in the medical industry today. The most commonly related evidence to this point, concerns his victim, Anarcha, an enslaved Black woman, on whom he practiced his surgery over thirty times, without anesthesia. Another account, published by Sims himself in the New Orleans Journal of Medicine, details the treatment of mouth cancer of an enslaved Black man named Sam. Sam refused to be treated for his affliction, but Sims wasn’t having it. He customized a barber chair to lock Sam in place, and then tricked his victim into sitting in his trap. Sims’s account of these events appear completely ignorant of what reads as sadistic racism. Despite recent historical analysis, monuments still have supporters away from the fray of politics. For instance, art historian Michele H. Bogart makes a case that monuments could be amended with plaques, markers or educational tours, and be used to teach vital lessons about history. Following Bogart’s recommendation, we are forced to wonder what type of modifications would have to be made to the Sims monument so as to accurately portray the present day understanding of history. This is why the work Doreen Garner has produced for White Man on A Pedestal, is so vital to the understanding of the controversy currently surrounding the Sims monument, and monuments in general. Garner’s recreation of the Sims monument was one of the more prominent objects in the gallery at Pioneer Works — 3D printed from a scan of the original statue, painted with a blood-tinted polyurethane, and then placed on a concrete block with the title scrawled in it, Poneros, a Greek term found in the Bible which translates loosely as “karmic retribution.” A few steps away from the base of Sims is another Garner sculpture titled Rack of those Ravaged and Unconsenting — this is a large meat rack, similar to one found in a butchers shop. 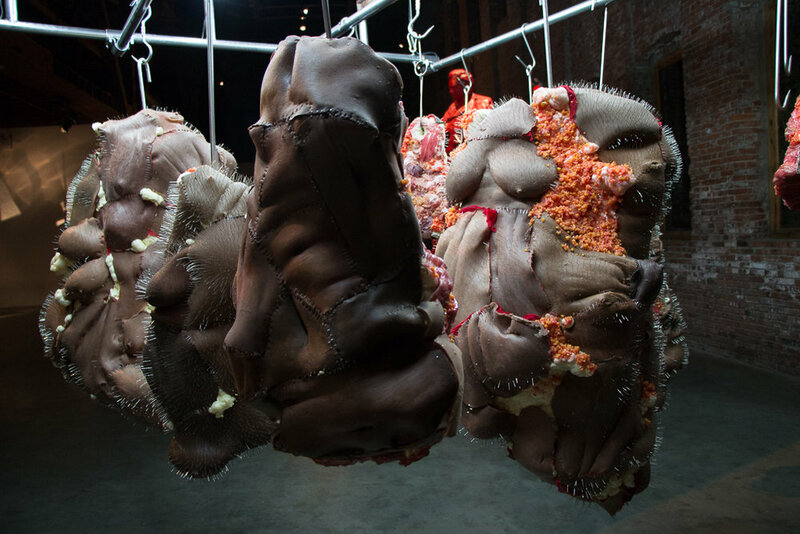 In place of butchered animals hanging from the meathooks, Garner has created about a dozen sculptures made in the grotesque style that she has become known for. These objects represent the bodies of victims of the American medical industry, distorted by nightmares and barely recognizable as human. Made of silicone, insulation foam, glass beads and steel pins, sometimes a breast, rib, or hand will appear on the amorphous mounds of brown skin, fat and organs, still wet in the wake of a surgery gone wrong. They are painful objects, the elements that were rejected from the pre-Civil Rights biographies of Sims. Standing between Rack of Those Ravaged, and Poneros, the history is visible in tangible objects — a history that may be present in the minds of some whenever an object like the Sims monument is encountered, and now rendered visible by Garner, clear as day for all to see. The horror of the medical history on full display through a series of other Garner made objects — a gynecological tool display case, a coffin, an amputated leg. It would be a rare person that was not shocked into understanding how the Sims monument affects some when viewing WMOAP. And in case it wasn’t clear enough, Garner created a performance titled Purge, in which she conducts the vesicovaginal fistula surgery on a life-sized effigy of an exhumed Sims with five of her friends. The ferocious motions of the performance embedded in the muscle memory of its actors, creating in itself a new way to perhaps recall the history of a doctor who rose to fame on the abused bodies of the oppressed — a new way much more appropriate than honorific statues. For the second stage of the WMOAP ontological factory, participants find in Kenya (Robinson)’s work a conceptual understanding of a way forward from this history. Since 2013, (Robinson) has been working on project titled #WHITEMANINMYPOCKET, in which she calls into question racial constructs, and especially the place of Whiteness in conversations about race. 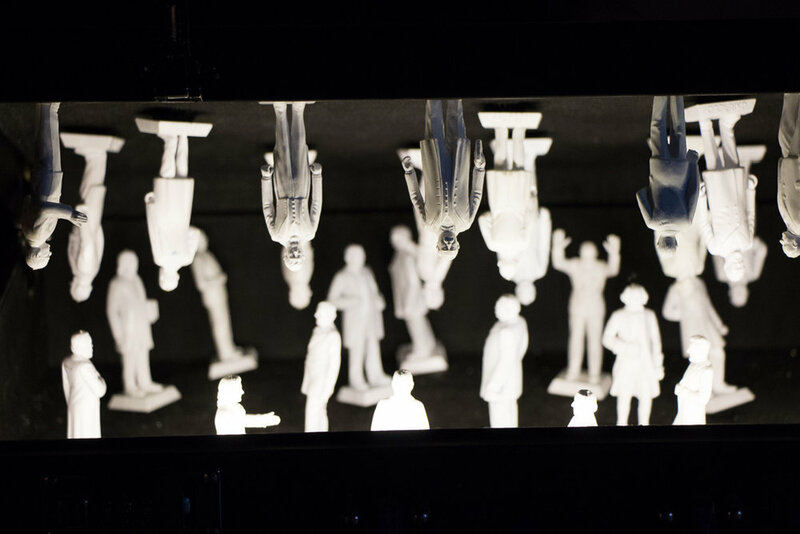 #WHITEMANINMYPOCKET involves a series of five-inch-tall, plastic White men, dressed in business suits and carrying a briefcase, which (Robinson) has named the DAVES. (Robinson) says that these objects represent a belief that “privilege is plastic,” and that anyone can take on attributes of Whiteness by keeping one of the talisman in their pocket. What do the attributes of Whiteness look like? According to (Robinson), one example would be certain attributes that were necessary in order to get White Man in a Pedestal into a gallery like Pioneer Works. In this act of burying the plasticity of Whiteness, parallels could be drawn to present day national politics, such as he controversy surrounding the Affordable Care Act. But the burial of the Dave Fowlers and (Robinson)’s request to share, should also help make visible just how many American social institutions benefit to this day from a history that involves the brutality of a domineering Whiteness, much in the same way that medicine has. Despite parallels to current events, a direct or topical interpretation of WMAOP is unnecessary. Rather, we can imagine for ourselves an ontological factory such as this, tailor made for every monument in America (metaphorical or literal,) rendering visible the Whiteness of each one. So as to end the rule of White masculinity, bury it, and make it share what was gained from his abuses. White Man on a Pedestal took place November 10-December 17 at Pioneer Works (159 Pioneer Street, Red Hook, Brooklyn).